Guess what? Your favorite vacation rental dashboard is going "responsive". 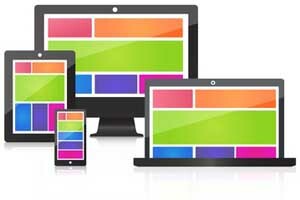 "Responsive Design" is the term the online community is tossing around to describe web-pages that "respond" to the size of screen they are being viewed on. When you're looking at it on a small screen like a typical phone, it will "collapse" into a more vertical view to accommodate. When you're looking at it on a large screen like a monitor or a decent-sized laptop, it takes advantage of that space to give you a more professional and productive experience. So far we have implemented this on two of the most-used Dashboard pages: the At-A-Glance tab, and the Booking Details page. We intend to convert more pages to be responsive in the coming months. Responsive design is not perfect. Some pages just do not translate well into very small screens, and it should not be surprising that your absolute best experience is going to be on a real computer, with a real mouse, a real keyboard, and a reasonably-sized screen. But the new pages should go a long way to helping you stay productive when you need to, even when all you've got is a phone. As always, we need your feedback, so please let us know what you think, ideas for improvement, etc. Hi John, we are having problems with the wigets not being a responsive design, many people use mobile applications now, is there somewhere we can get the responsive widget code? Which widget(s) are you focusing on? I can tell you that the public booking calendar is undergoing an overhaul that includes a "responsive" design. But it's a few weeks away. And so are the other items although they really should be relatively responsive already. Also: have you tried simply using the mobile version of the booking calendar? Hi John no I haven't tried that is there a link to the code somewhere as I cannot see the the mobile version of the booking calendar in widgets? Yes there is. Simply add "&mobile=true" to the end of the URL for your calendar. You can obtain the full URL of it by simply answering "yes" when the normal one asks you if you'd like a mobile-optimized version of it. that works for the calendar but not the rate table for some reason. Odd - the rate table should already be responsive (from long ago). Is it the containing iframe that is being set to a specific pixel width, instead of a percent? Email me about this ok? We tell our property managers all the time that they are selling the most perishable product on earth: time. Un-rented days are very expensive for most VR managers, so getting something is better than getting nothing. When the dates are gone, they're gone. You'll never make any money on those dates once they've gone vacant. We are happy to announce a new feature, one that has been talked about for quite some time. We now at last have a beta version of it, ready for your brave testing. The idea is simple: as your vacant dates get closer and closer to going unsold, you can gradually increase the discounts - put your properties on sale - automatically, based on a schedule that you define. You set up a schedule of discounts to be applied depending on how close to the check-in date the booking is being made. Note that your rates themselves are not altered: the Auto-Discounter simply calculates a discount and applies this to bookings/requests/quotes when they are made, if they qualify. These discounts do not "compound" on each other either: Bookerville looks for the discount that is closest to the check-in date, and applies only that one auto-discount. If you use the Auto-Discounter, it's probably best not to advertise this in a generic way to prospects, as it will encourage them to wait until the last minute to book, getting a better deal. But you might advertise or announce deals as the vacant dates approach as a kind of "special" - maximizing the effect. This can be a powerful tool to help you move inventory that would otherwise go unsold. As always, please let us know your thoughts. Does the auto-responder use the discounted rate and does it promote the fact that the potential renter is receiving a discount? I see that this is a free trial. If I already have a paid subscription will it be offered as part of my existing subscription or will I have additional costs after the 30 trial? Pam - this is a new feature that is available to every Bookerville member, whether in free trial or already subscribing. 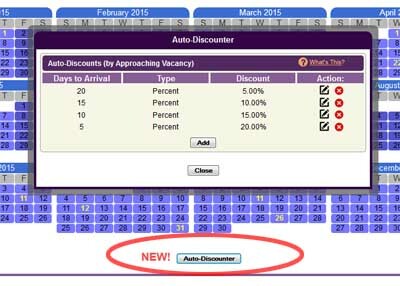 There is no additional fee for using the Auto-Discounter feature. Thanks John. I understand the need to test the mechanics of the discounting. As you point out, discounting can be a great marketing tool. I can see that a potential renter might miss the fact that they are being offered a discount in the scenario you described. From a marketing perspective, not promoting a discount at the time a discount is being offered is a wasted opportunity. So in a future release of the auto-discount feature, I would hope for a couple of additional capabilities. 1-allow us to give the discounts names (e.g. Last Minute Special) similar to what you do with coupon codes. 2-Allow us to add a text string that draws attention to the discount. Hi Ron - well, it will probably be very difficult to do that - mostly because it can damage the concept of "Net Rent", which plays such an important role in so many calculations. But we can sure look into it. What do you mean by adding a text string to draw attention to the discount? Thanks John. I wasn't asking for the calculation to change just an option to label it differently if I chose to do so. So changing the "Discount" line to say something different like "Last Minute Discount"? I won't speak for Ron but something like that wording would be good. That is correct John. Giving a discount without calling attention to the fact you are giving the discount is just not good marketing. As to the text string suggestion, I saw that as an option if it was too difficult to dynamically change the label of the discount. Basically it would be a user defined, optional short sentence to call attention to the discount being provided. Actually both would be good, but I don't want to be too greedy. Ok. Just to be clear here though: it currently will show it as a discount, but it's going to call it just "Discount", not "Last-Minute Discount", or "Fire Sale" or anything like that. That's the part that I don't know if we're going to be able to do - modify the "Discount" label depending on what kind of discount it is.